It’s quite simple really, although you do have options. 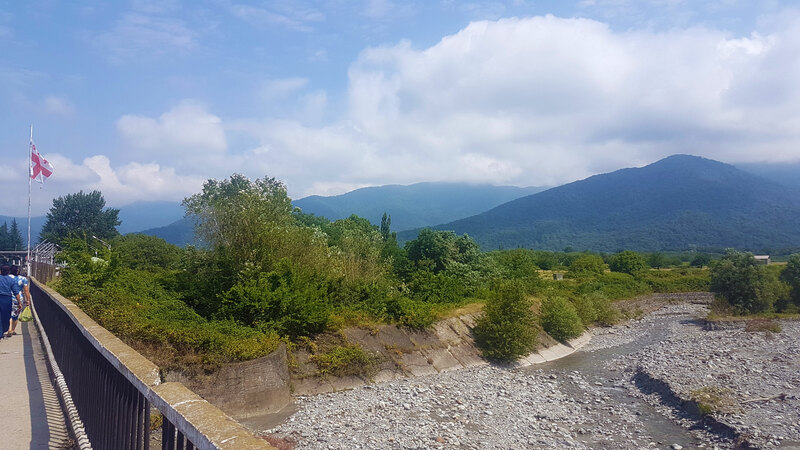 We had heard that travelling via Sheki would be a nice detour on our way, as it was a very historical town with some nice hiking. 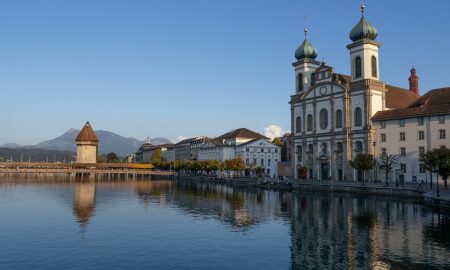 It’s located around two hours from the border, however, the train gets in at a very inconveniently early time (5am, if I remember correctly) and the station is located a way out of the town itself, so think about whether the slightly inconvenient logistics are for you. Taking a marshtruka to Sheki is also an option and reasonably cheap, however, when you consider you are travelling quite the distance, somewhere to sleep overnight that isn’t a cramped minibus is always preferable. 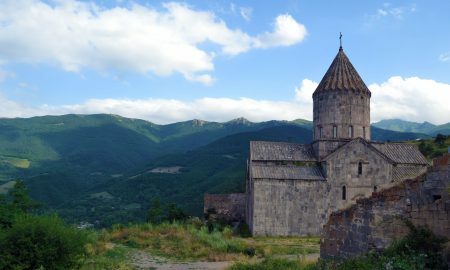 Your final option is of course to take the train from Baku to Tbilisi, however by doing so you’ll miss out on the Kakheti region of Georgia and your chance to drink your fair share from the ever-refiling glass that is the Georgian wine industry. So if yours also looks like this, well done. You have taken a very important first step towards boarding this train. 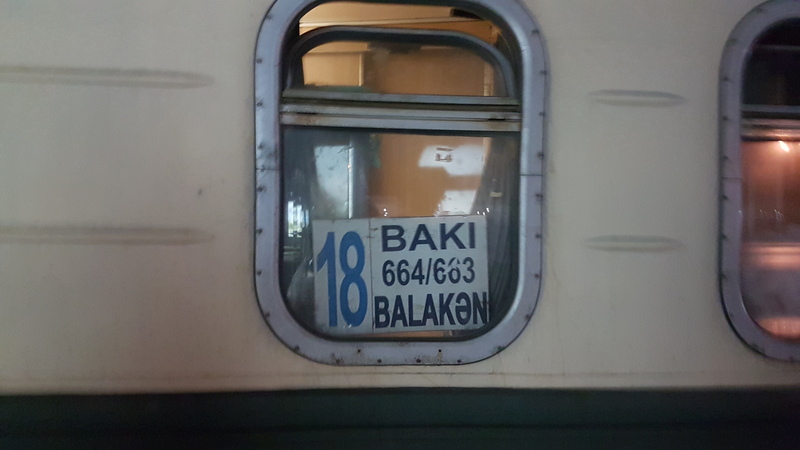 Now, there aren’t any screens indicating which of the many platforms your train might go from, so you just kinda need to know/slash wander ’til you find a train which says ‘Balakan’ in the window. Whatever you do, don’t get on the train to Tbilisi! This is the wrong one. A small, angry woman checked our passports rigorously before letting us on the train, frantically looking back and forth between our tickets and passports to match up our names. Eventually she decided that the names on our tickets were indeed the names in our passports and she let us on. 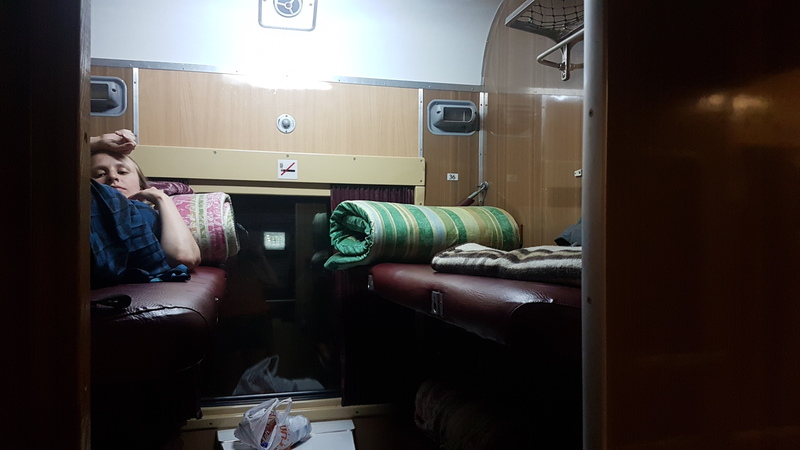 I hadn’t been on a sleeper train since I was in Vietnam, and so at first I was excited to be having this experience. 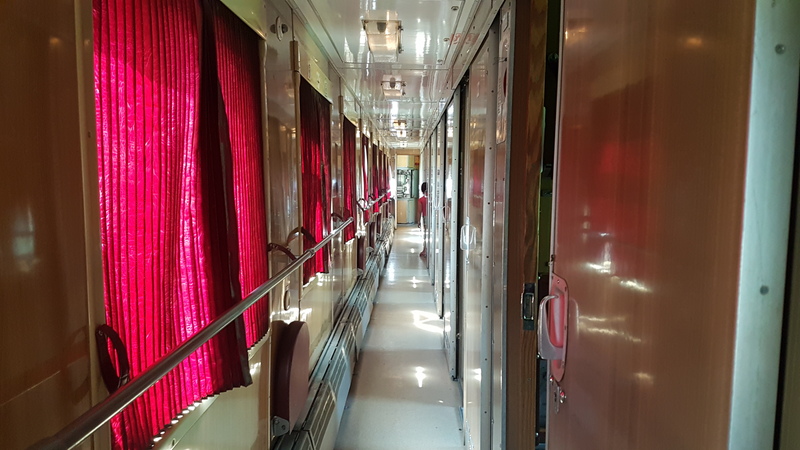 The trains were as you’d expect – a soviet delight in terms of appearance. The bunks looks reasonable, although I later found out my legs were about a foot too long for mine, but by choosing the most expensive ticket (15azn) we had unknowingly bagged ourselves aircon that gave a bit of a half-arsed performance. However, the joys of sharing a carriage with two strangers soon came to fruition as we were then joined by two middle-aged, incredibly creepy men who would not leave us alone. I won’t go into the details but I slept with a sharp object in my shorts! I’d actually found Azerbaijan the least comfortable place to travel as a woman. At around 9am, having slept with one eye open and ignored the two men’s persistent attempts to wake me up by shouting “Cherry! Wake up Cherry!”, they got off the train, after ten long hours. The train itself takes eleven hours to reach Balakan, but it feels like a lifetime. 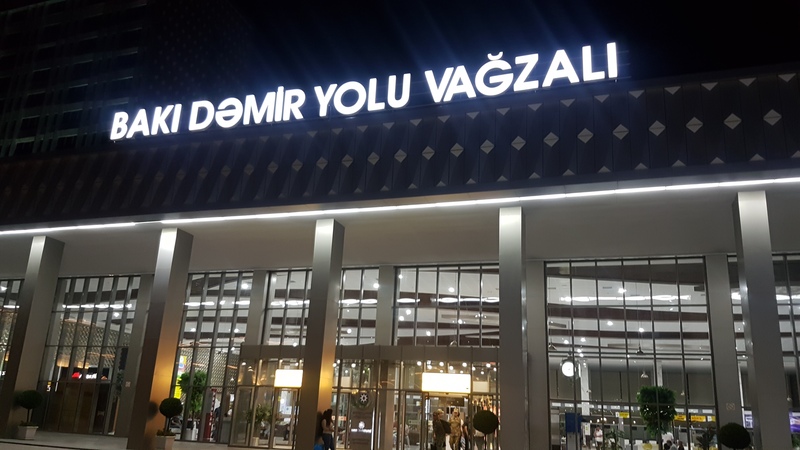 Despite all the rapid development around the capital due to its oil wealth, high-speed trains, unfortunately, do not yet exist in Azerbaijan. I’m pretty sure the train never travelled much faster than 20mph at any given point and it wasn’t the smoothest or quietest of journeys to enjoy. But alas, we were just happy to have arrived! We got off the train at the Georgian border town of Balakan, and the station is quite simply, as far as I could tell, not really near much at all. All that awaited on the station platform were a few mangey dogs and a gaggle of men urging us to choose them and their run-down Ladas to make the trip to the border! You can hang around and wait for a marshtruka, however, we were in no mood to do so and so took one of the locals up on their offer of transportation. Get your haggling hat on at this point – they’re ready and willing to rip you off. We got our driver down to 10AZN (£4.50) which was, of course, highly inflated but we just wanted to get out of Azerbaijan at this point. The change in scenery was striking. Just twelve hours ago we were in an arid desert, and now all of a sudden everything was lush, green and mountainous. 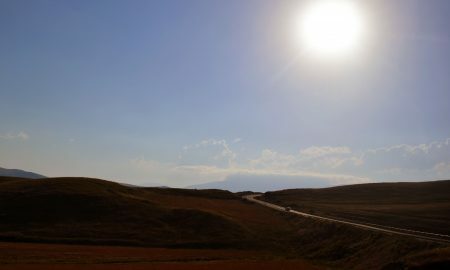 The journey took around fifteen minutes through the town of Balakan and along the winding roads to the border crossing. 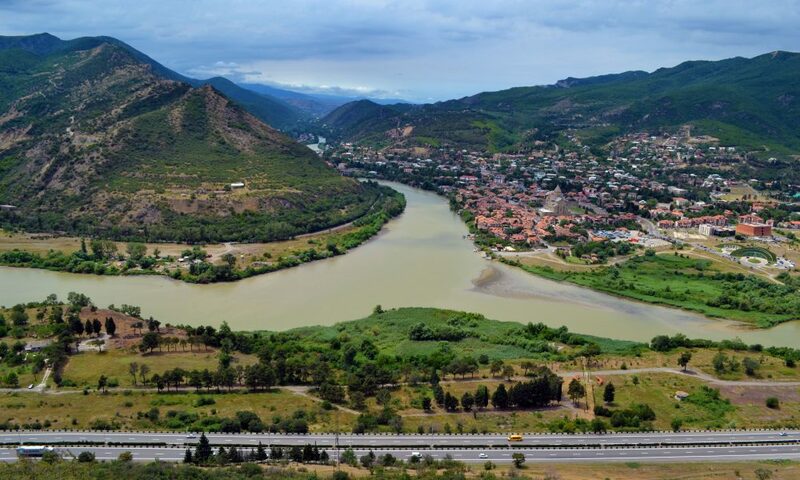 I’d heard horror stories of long queues at the border and to have my story straight regarding whether or not I would be moving on to Armenia, however, the crossing was very smooth. It was mostly locals there and so we were able to bypass the queue! 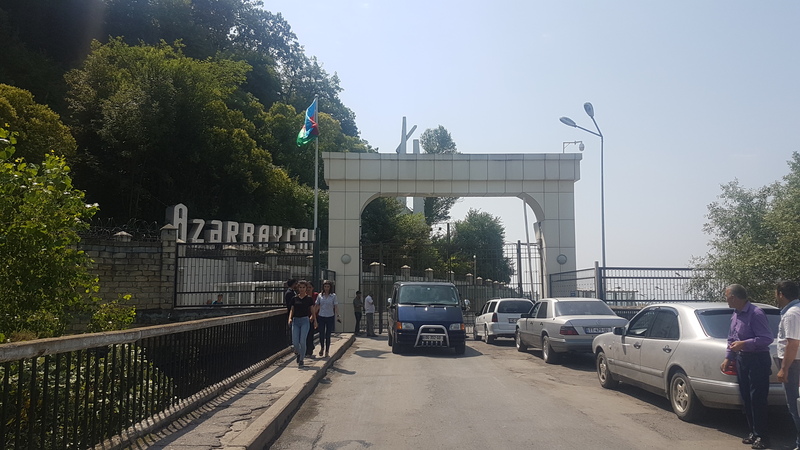 Btw – if you want to get crunk, look to your left as you enter on the Azerbaijani side. I’m talking £2.50 for a 1.5 litre of vodka. 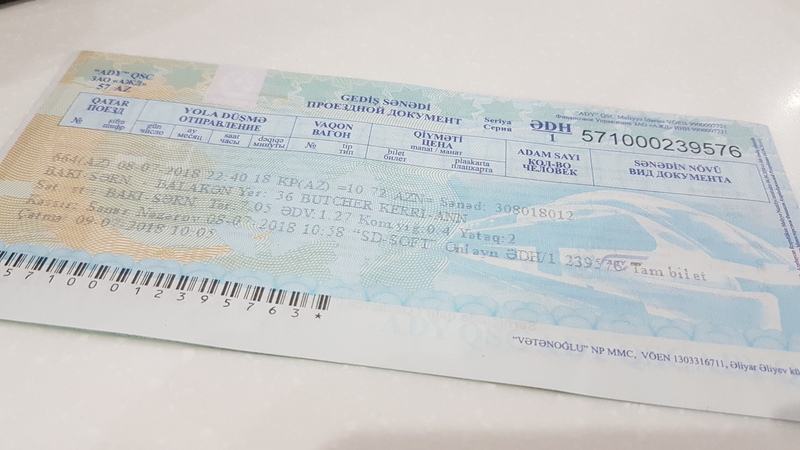 We had our e-visa printouts checked (so make sure you have these to hand, and also retain this throughout your trip as for some reason you will need it to exit) and soon began walking across the border bridge. The transition on the other side was just as smooth, taking no more than five minutes. Before you know it, it’s Azerbaijan behind you, and Georgia in front. It’s quite something. 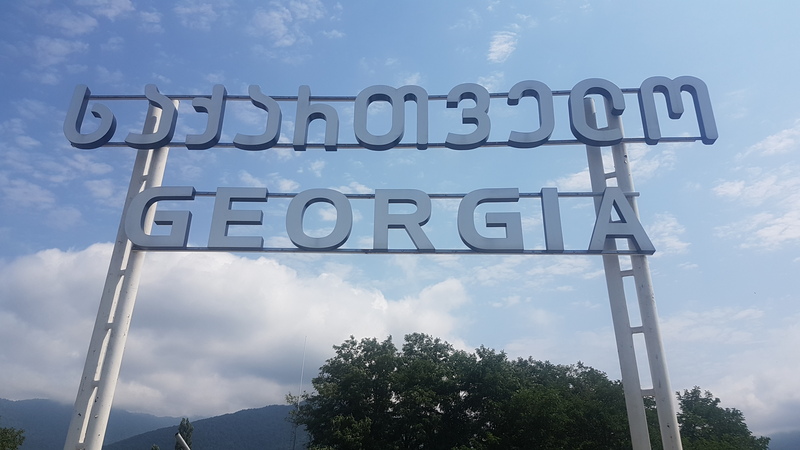 We did meet two other foreigners at the border – some annoying, rich, middle-aged Americans who seemed upset to have encountered other foreigners, thinking they were the first of their people to step foot in Georgia… We saw them again getting in their private car on the other side. FYI you can use the “very cheap, very excellent quality” toilet facilities – as described by the owner herself – on the Georgian side for 1AZN. While there are many places to explore from here, we headed to Sighnaki, which cost around 50AZN (there are marshtrukas, but we were still in our “get us there now” states of mind), and the hour-long journey winding through the mountains was pretty spectacular – all without seatbelts of course, and at the expensive of both a snake and a lizard’s life.